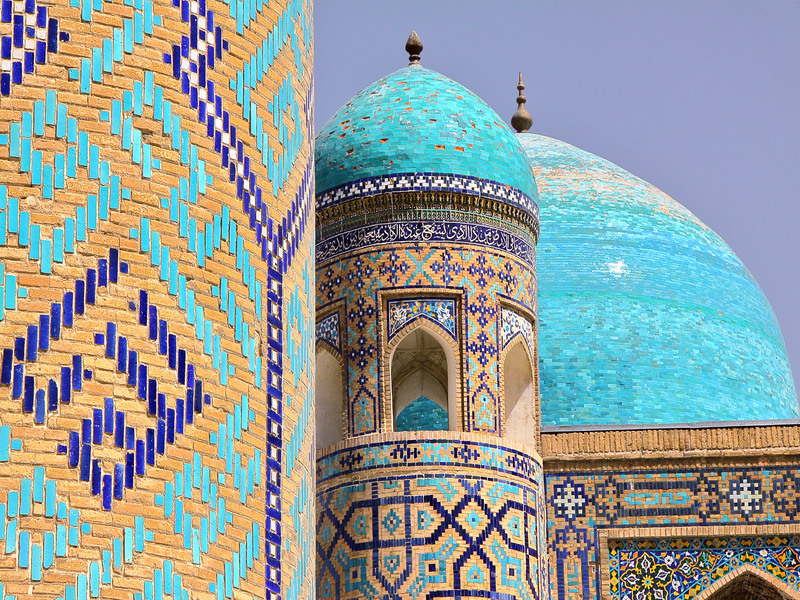 On this 7 day journey through Uzbekistan, we will visit 4 very different cities, each with its own character. From Tashkent to Samarkand, Bukhara and then finally, Khiva, we will take you through the heart of Central Asia’s Silk Route and rich Islamic heritage. 3rd trip: 26 October – 01 November 2019. Comfortable Muslim-friendly hotels with excellent halal breakfasts. 4 cities: Visits to the key cities of Samarkand, Bukhara, Tashkent and Khiva. Tour guides: Our professional and English-speaking local tour guides are extremely knowledgeable experts, one for each city we explore on this journey. Full board: All your meals are catered to. Breakfast will be in the hotel and will consist of a traditional Uzbek and continental spread. Lunch and dinner will be in restaurants serving authentic local food, such as the local delicacies of plov and somsa. All transfers: We cover airport transfers and your transport throughout the trip, in a fully air-conditioned vehicle. Sit back, relax and enjoy the ride! Desert Nomad experience: We will spend one night sleeping under the stars in the legendary Kyzl-Kum desert, in a traditional yurt. Airport pick up is between 07:30 – 08:30 am local time at Tashkent Airport. Recommended flight is the 17:00 Turkish Airlines flight departing from LGW. Drop-off is at approx 2 pm local time to catch the recommended 16:20 return flight with Uzbekistan Airways to LHR. We are awaiting further flight options to be published for this trip, which will be announced shortly. 7 October: Airport pick up is between 07:30 – 08:30 am local time at Tashkent Airport. Recommended flight is the 16:45 Turkish Airlines flight departing from LGW. 2nd November: Airport drop off is at approx 7 am local time to catch the recommended 09:15 return flight with Turkish Airlines to LHR or LGW. 7th September: Departs London Gatwick at 17:00 with Turkish Airlines, and arrives in Tashkent at 07:00 local time. Trip 3: We are awaiting further flight options to be published for this trip, which will be announced shortly. 27th October: Departs London Gatwick at 16:45 with Turkish Airlines, and arrives in Tashkent at 07:15 local time. 2 November: Departs Tashkent with Turkish Airlines at 09:15 local time, arrives at London Heathrow at 16:15 or London Gatwick at 15:50. Please note that if you are travelling from the Midlands/North, it is recommended to fly from Heathrow or Gatwick to secure the best-priced flights. Min. 15 people. Places are limited and will be allocated on a first-come first-serve basis. Marvelling at the huge and intricately tiled madrasahs in Registan Sq, Samarkand, and uncovering the history behind them. Uncovering empowering stories about the contribution of Muslims towards maths, medicine, science, astronomy and so much more. We will take you through the Golden Age of Islam in Uzbekistan, featuring the likes of Ibn Sina, whose contributions towards medicine reached as far as Europe and beyond… Al Biruni, whose lunar calculations are used even to this day…and Al Khorezmi, who gave us the algorithm as we now know it. Trace the exact steps of the Silk Route caravans that once traversed these lands loaded with silk, porcelain, spices, incense, ceramics and many other precious goods. To receive the detailed itinerary, complete the booking form below and request the information pack. Please note this is an introductory price as we have secured a good deal. We cannot guarantee this price for future trips. £850 per person/double or triple room. Payment can be made in 3 instalments upon request. Internal flight from Khiva to Tashkent (which is required as part of the trip itinerary) is 50 USD and can be paid nearer the date of the trip. For the full details about what is included in this package, head over to the ‘Details’ section. To confirm your space you will be asked to pay a £150 deposit which is non-refundable. You can cancel your reservation up to 2 months before the departure date free of charge (excluding deposit fee). We reserve the right to cancel the tour up to 40 days before departure if there are not enough persons. In the unlikely event this is necessary, we can make alternative arrangements for you to visit Uzbekistan upon request.